After my parents divorced, we moved to the corner of my grandparents' farm. Not a day went by that we didn't zip down their leafy drive, sneak a Hershey's kiss from the blue-and-white crock on the counter, and hope for a compliment (or two). Grandmother was a generous person, but never more so than with her encouragement. My everyday prayer is to spend cheer so lavishly on my own children. Creativity, confidence, time and praise: cost nothing, require no space, and are remembered forever. That's so beautiful..there's nothing like encouragement. And grandparent's are so good for that! What a lovely tribute to your grandmother and what a lovely gift she gave you to pass on to your children. 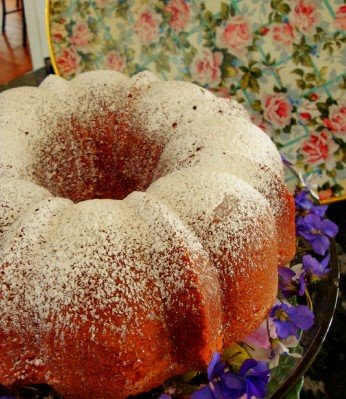 Also, the pound cake is very pretty with the violets around the base. I sometimes put flowers in a small vase that fits inside the hole in the cake, which I think is also pretty. Well that is just plain lovely. What a sweet and wonderful sentiment. I don't think you need us to tell you that you are living that out every moment. You aren't just passing it on to your children either. You are passing it on and encouraging so many through this blog. Your grandmother would surely be proud. That is how I feel about my dear grandmother. She lived in Houston and I lived in Pflugerville (about 160 miles apart) I spent every single summer with her. She was so sweet, so kind, and I never ever heard her say an unkind word about anyone. She had values that she taught me. She knew an education was so very important because she was pulled out of school at the tender age of 9 and put to work picking cotton. Her father had died and left 9 kids behind. They really almost starved. Meredith-- thank you so much for this-- such good truth here-- and why, whatever our means, our kids need never feel deprived of anything they really need. Lovely thoughts! And what a sweet legacy. Love the Hershey's kiss! My grandmother used to grab a metal measuring cup and dip it into a crock full of M&Ms when we got there. Such luxury. God, that makes me want to cry this morning. I miss all of my grandmothers. this post alone is so encouraging! thanks. Thank you for this priceless reminder. Meredith, I wrote a post last year as a tribute to my grandmother. The title was "The Encourager"
Very thoughtful and so true. What a great reminder to lavish compliments on those we love. What a wonderful post. I have sweet memories of my grandmother too. There's nothing sweeter than a granny! That's so beautiful! I love your sweet words. Grandparents can be so wonderful! What beautiful memories! Isn't it great how grandparents always have encouragement...and candy?! That picture is just lovely, too. Thanks for the sweet post. My grandmother was like that... I like to think that I'm an encourager! Your cake makes me hungry! What a wonderful memory. My own grandparents were a wonderful blessing as well. They were great examples, weren't they! what a sweet memory and thoughtful reminder. thank you. I think your blog as well as your mothering are beautiful tributes to your grandmother. How wonderful that you are sharing the blessings she gave you. As a child I often dreamed of having grandparents in my daily life. From the time I was 8 until I moved away from home - I lived less than a block down the street from my grandma. Many time I'd pop over after school or on a Sunday and she'd ALWAYS put on the tea kettle and we'd drink tea from her selection of very fancy tea cups. She had beautiful flowers in her garden and would often send me home with a cutting of sweet peas or some other flowers. I wish my kids could have that kind of close relationship with their grandparents - but one set lives 3 hrs away and the other set lives 18 hrs away. Encouragement is so powerful. Thanks for sharing this. Grannies are the best and know just what to say to a little girl with sunshine in her eyes - where her only concern is "Can I get a piece of german chocolate cake, grandma?" What a beautiful reminder of the power of encouragement. Do you mind? I'm sending this quote to every mother I know! On long summer days after we do every craft and go on every adventure, and then no one but mom wants a nap...this is a great reminder of what we are doing.